Next week at this time, the boys and I will be in West Virginia on a family vacation with my Mom's side of the family. Lori and Rebecca are sitting this one out at home (Becca is not travel-ready yet). 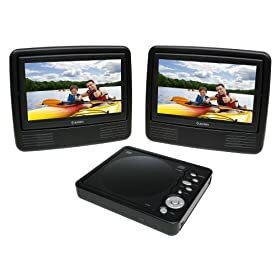 In anticipation of a 4-hour-plus drive with two rambunctious young boys I ordered a new portable DVD player from Amazon (shown below). It's made by Axion and has received mixed reviews. I hope it holds up for the duration of the trip so the kids can OD on Wall-E, Cars and Blue's Clues. It's amazing that a dual-screen portable DVD player is less than $150 these days. I remember when I got my old Panasonic in 2000 it cost around $700.